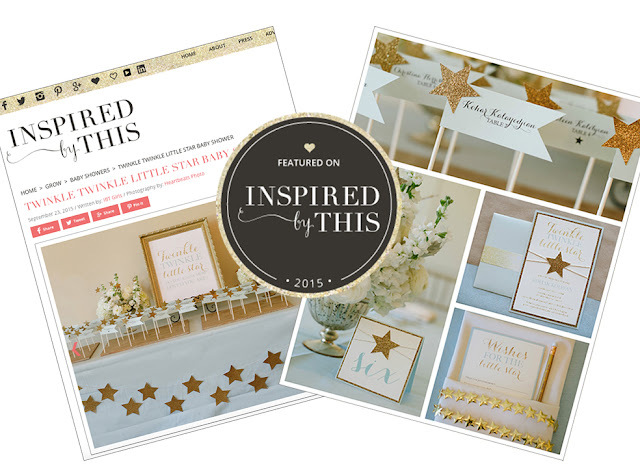 We are so thrilled to have this Twinkle Twinkle Baby Shower featured on the Inspired By This Blog! 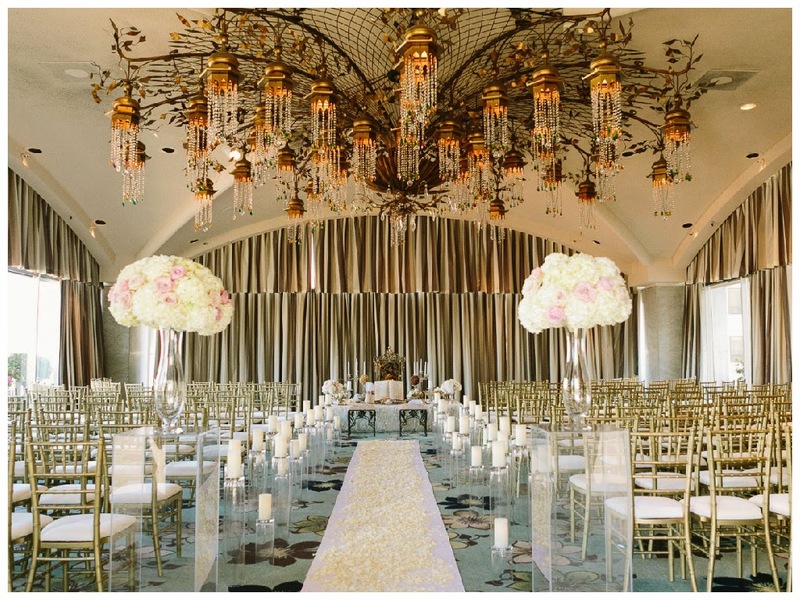 As an event designer I get to create something fabulous for my clients every day. 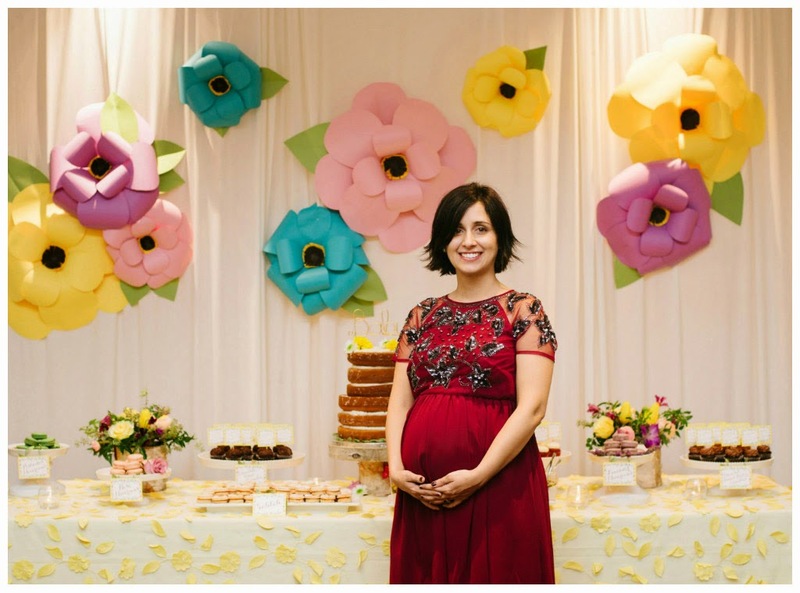 However, this baby shower was special to my heart as it was celebrating my darling sister-in-law, Kohar. We wanted a theme that was classy yet had touches of baby elements. I immediately thought of doing a ‘twinkle twinkle little star’ theme. 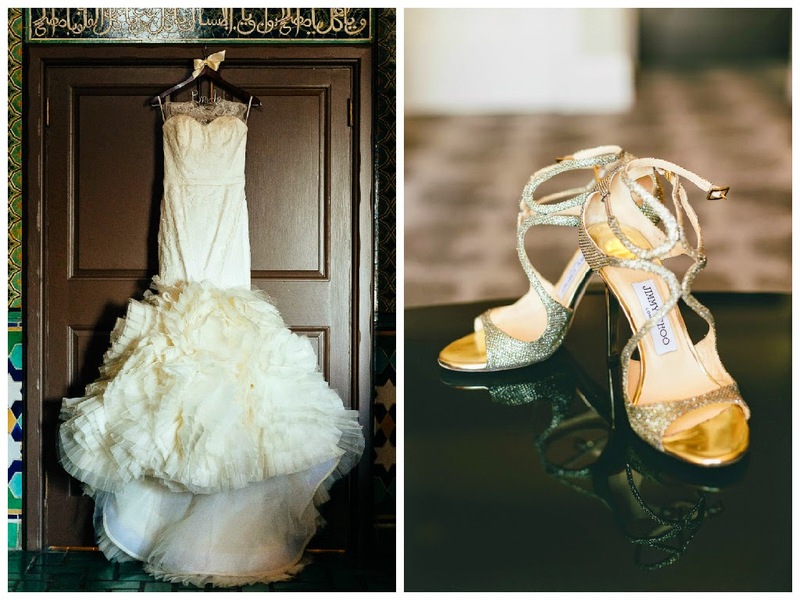 We kept the color palette very soft with light blue, white, and gold glitter. See below for more details! 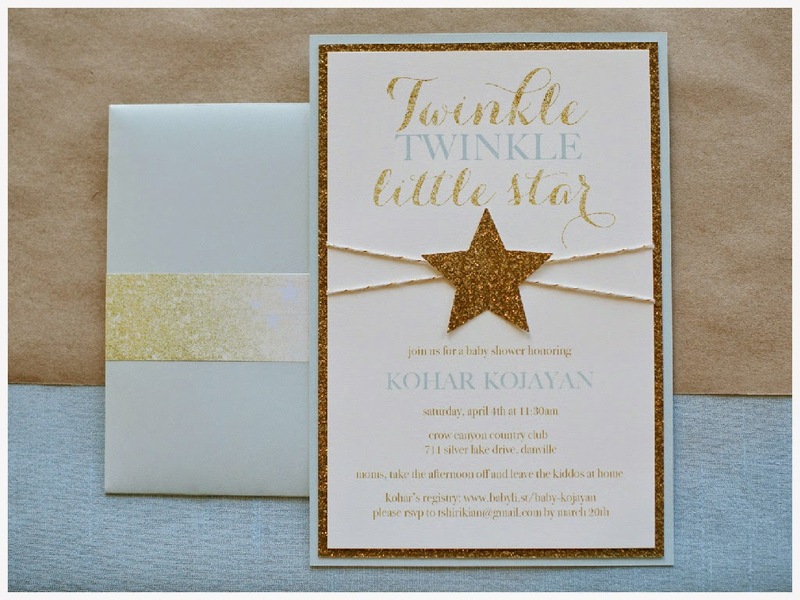 Invitations - The invitations were custom made with layers of gold glitter and ice blue card stock. 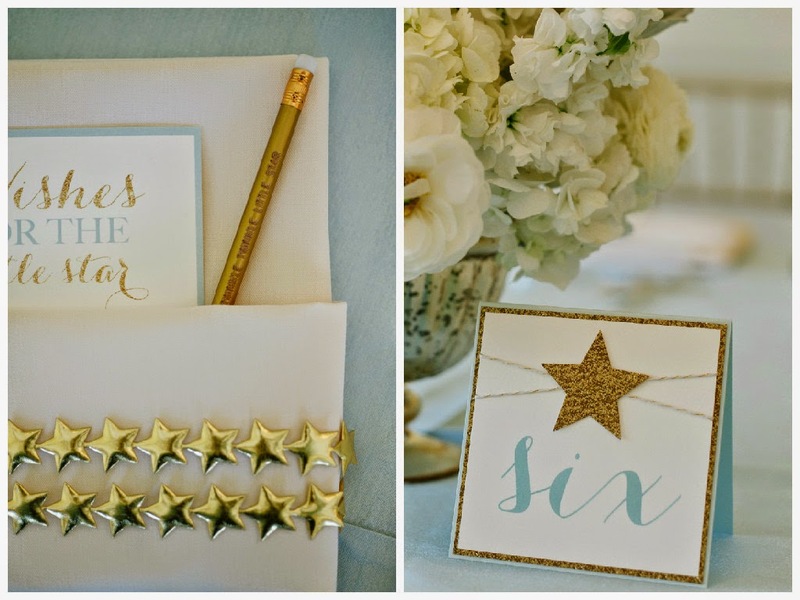 I used a star punch for the embellishment in the middle and wrapped gold and white twine around the invitation. 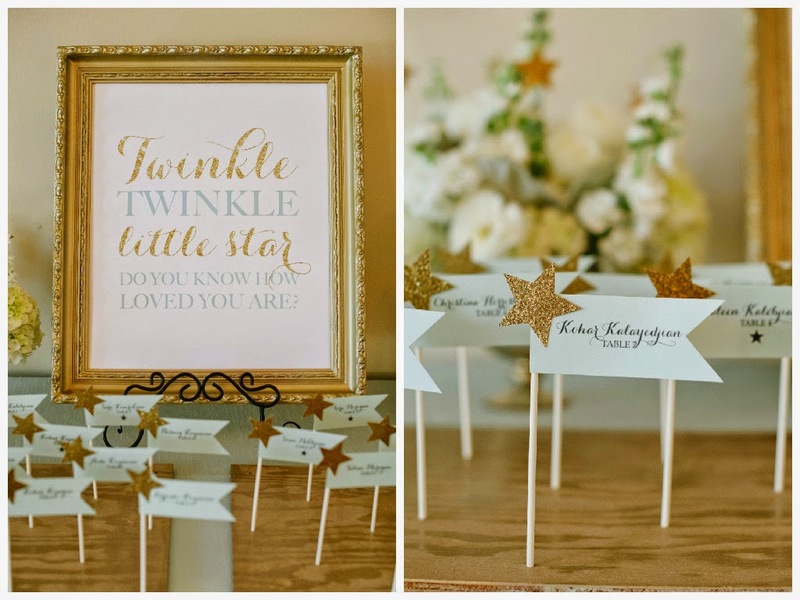 Place Card Table - As guests arrived they were greeted by the place card table that had a sign that said "twinkle twinkle little star, do you know how loved you are?". 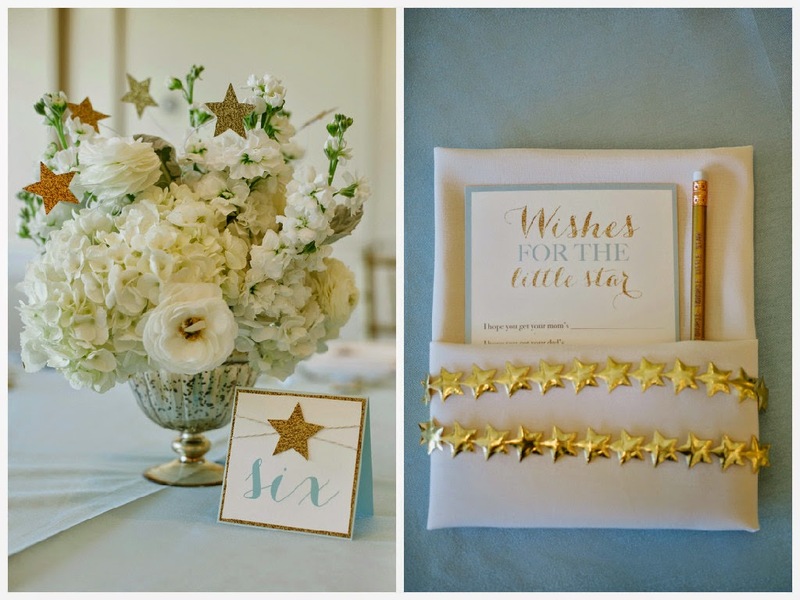 I wanted the place cards to look like shooting stars so I printed the names on ice blue card stock and attached a gold glitter star to the end. They were placed on sticks and sat upright on a wooden stand. 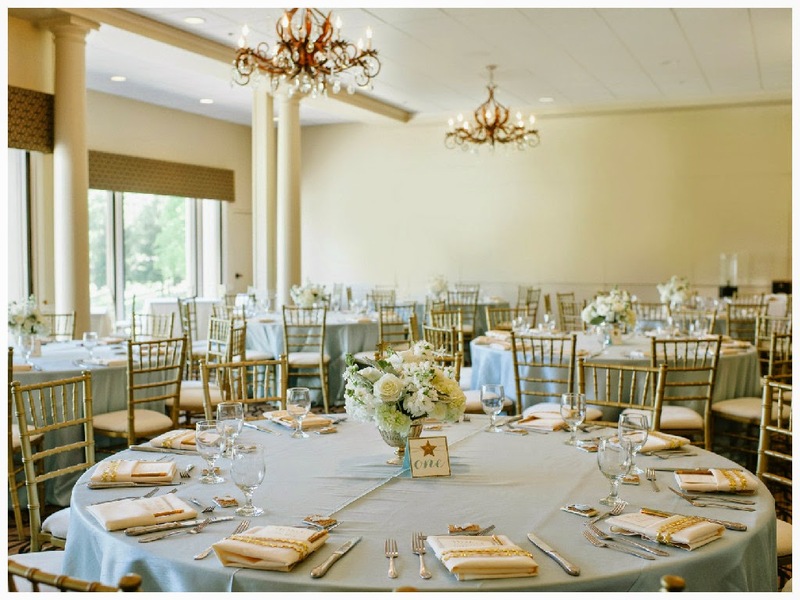 Dining Tables - the dining tables were covered in an ice blue linen and paired with gold chivari chairs. 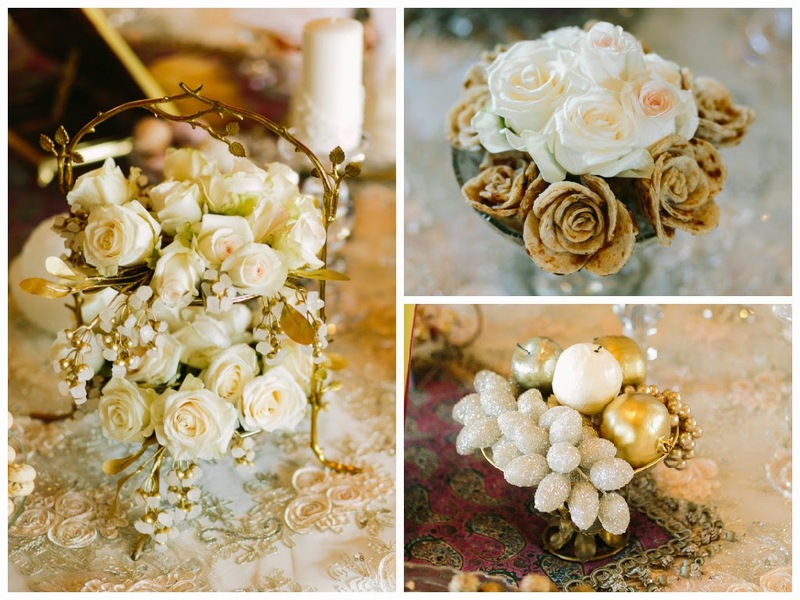 The centerpieces were a mix of hydrangeas, stock, roses, and ranunculus held in a gold mercury glass pedestal. 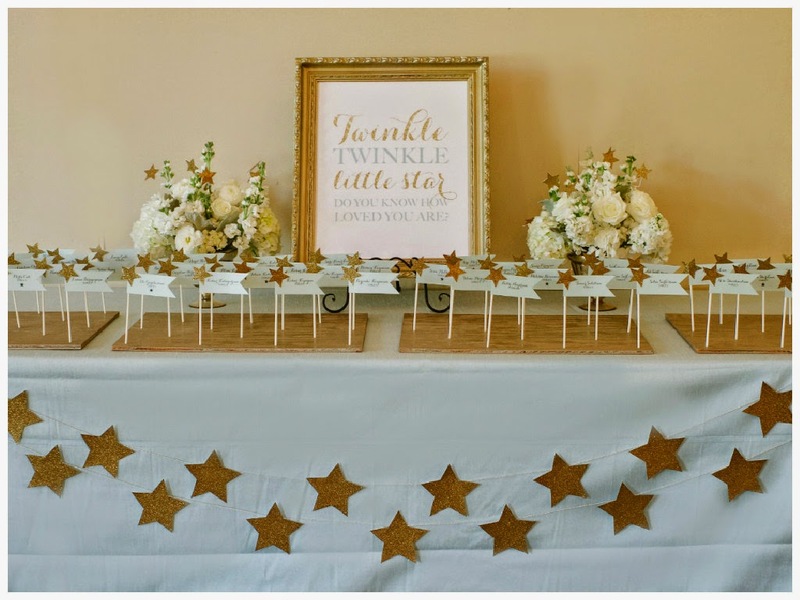 I made gold stars attached to white wire and stuck them in the centerpieces to continue the star theme. 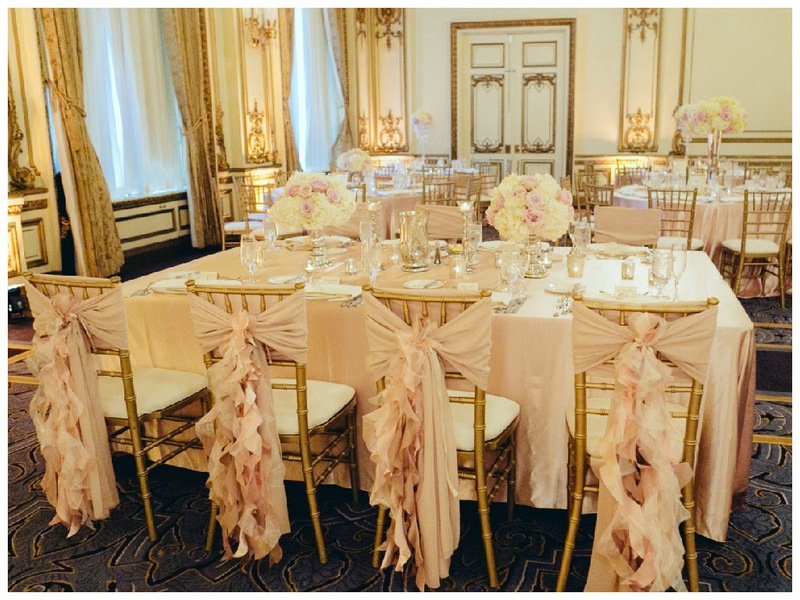 For the place settings I found a unique gold star ribbon that I wrapped around the napkin to give it a nice touch. 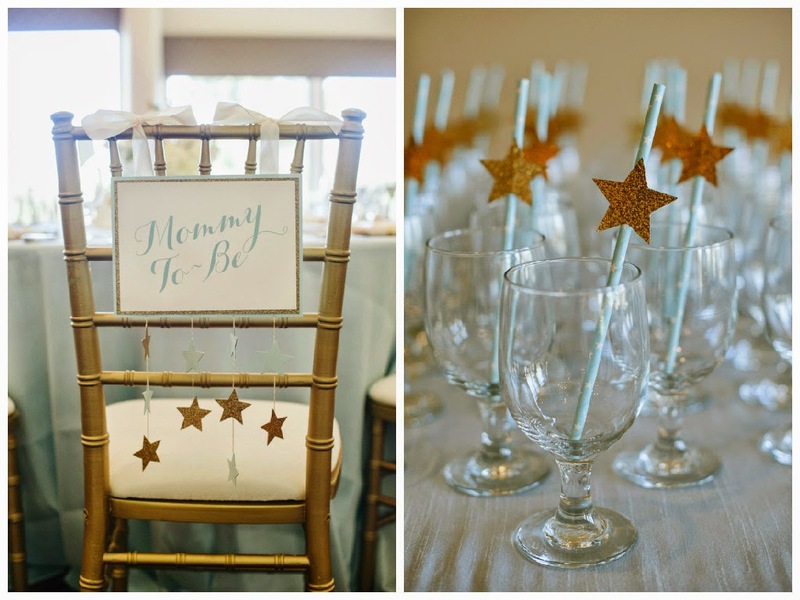 The napkin also held a "wishes for baby" card and a customized gold pencil that said "twinkle twinkle little star"
Activity Table - as an activity we had onesies for the guests to decorate with puff paint. Dessert Table - The dessert table was a huge hit. 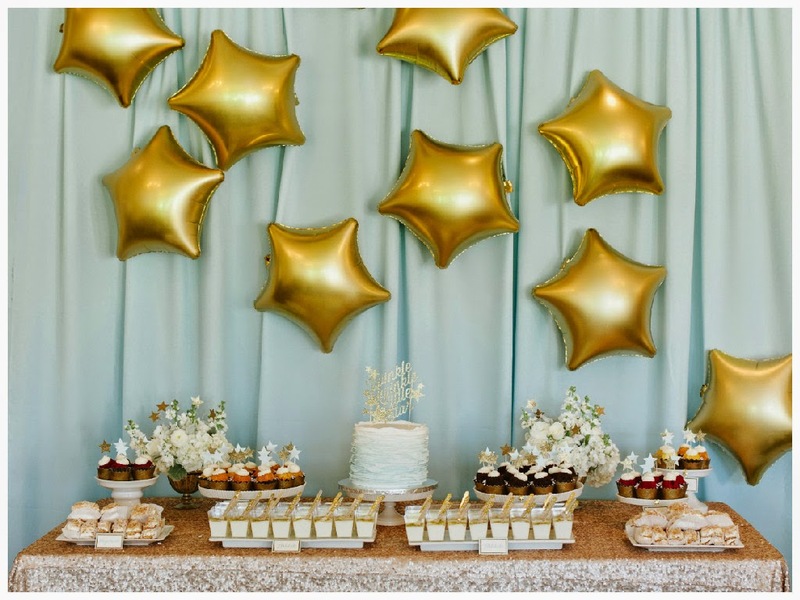 We had a blue draped backdrop with gold foil balloon stars going across diagonally. 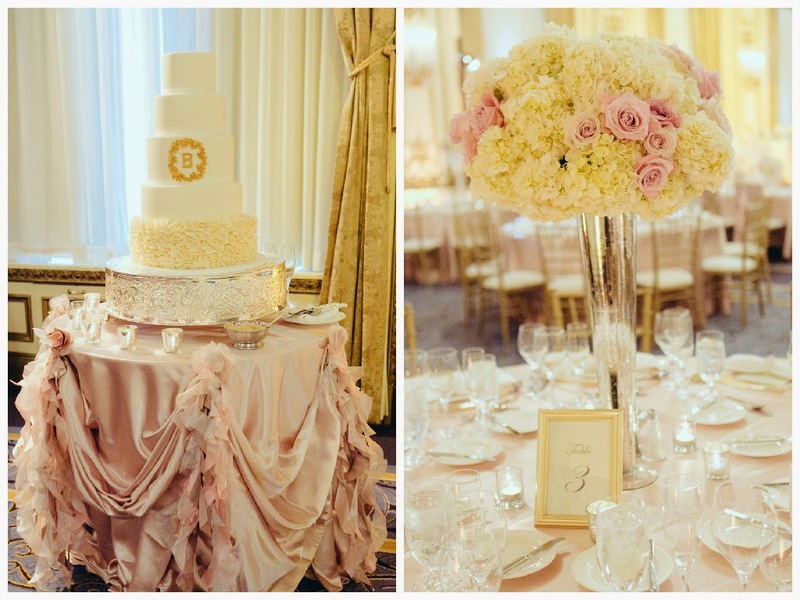 When I purchased the balloons they were too gold so I softened them a bit by spray painting them with a softer gold color. 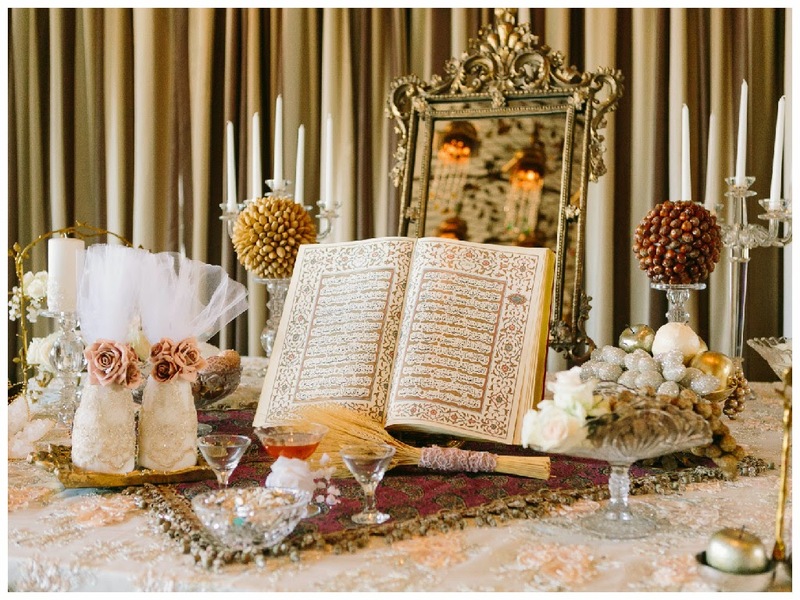 The table was covered in a champagne sequins linen and all the desserts were presented on white platters to keep the table looking nice and clean. 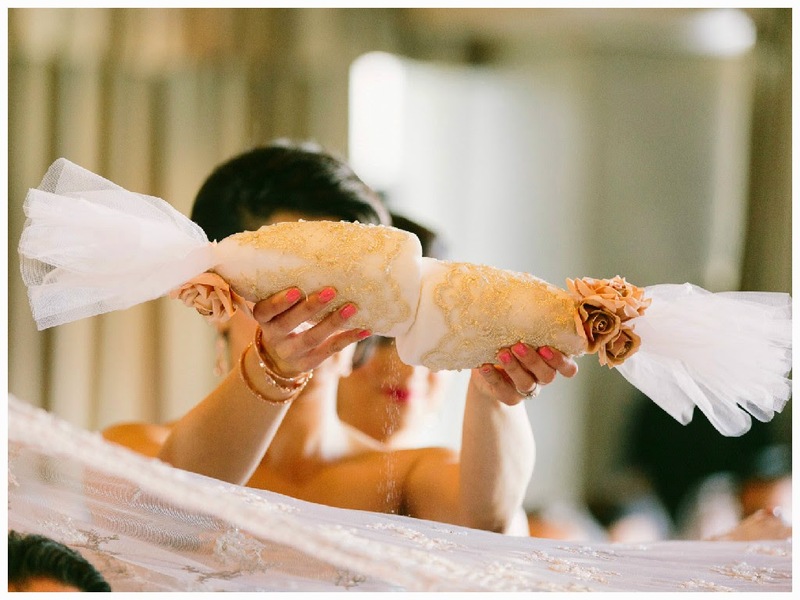 The cake was a ombre ruffled cake with a glittery cake topper that said "twinkle twinkle". 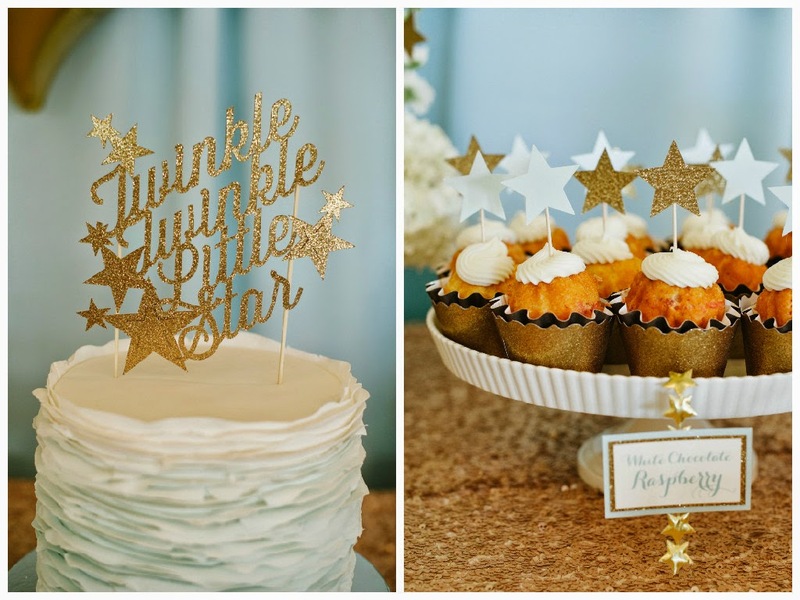 All the cupcakes were held by a gold glitter wrapper and a star topper. 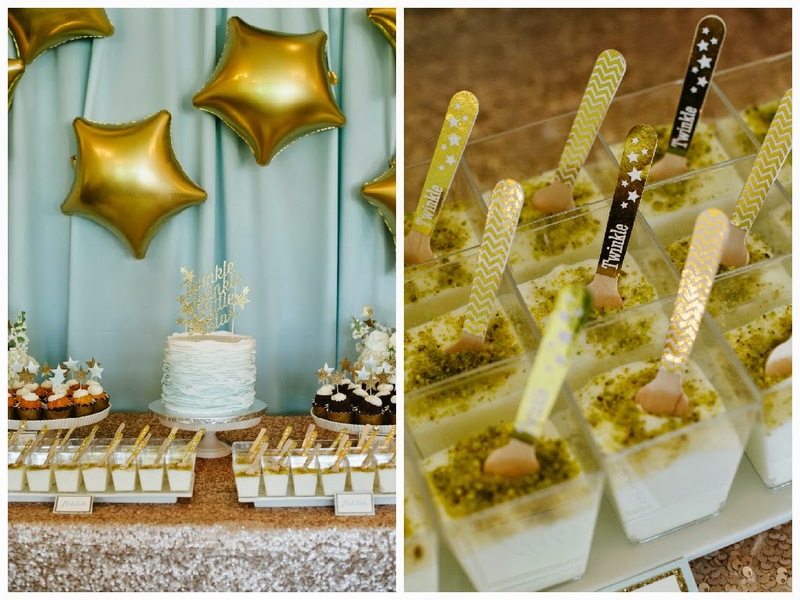 There was a traditional pudding that was served in mini cups with wooden straws that were embelished with gold chevron and "twinkle twinkle" stickers. 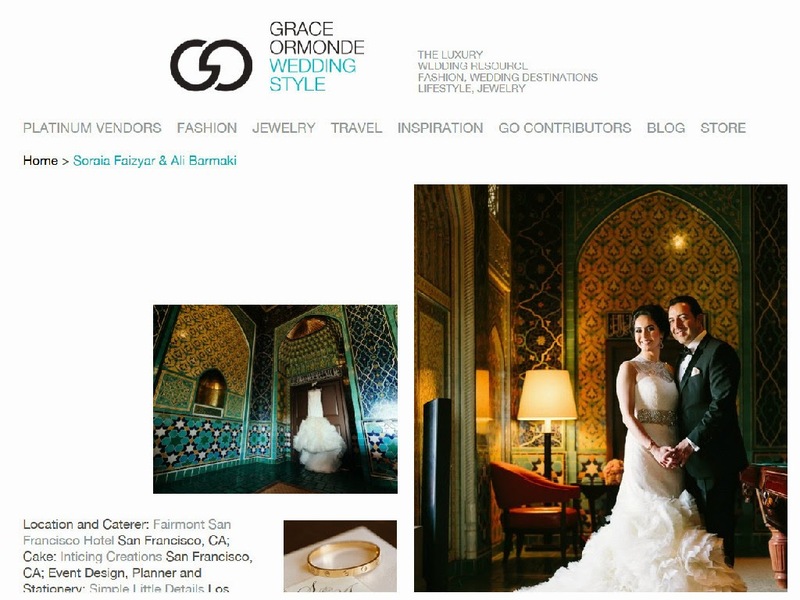 We are so excited to see Soraia and Ali's wedding featured on the Grace Ormonde Wedding Style Blog! 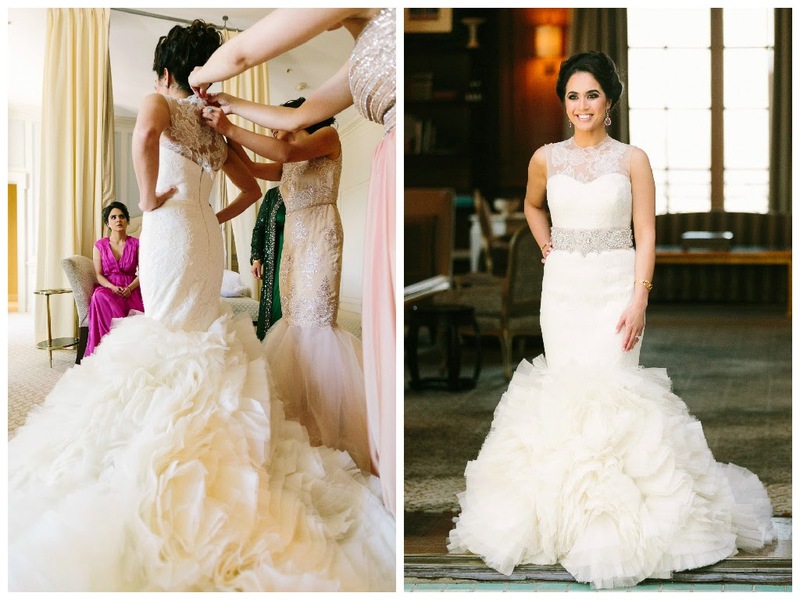 Check out the feature to learn all about the bride and groom and the whole wedding process. 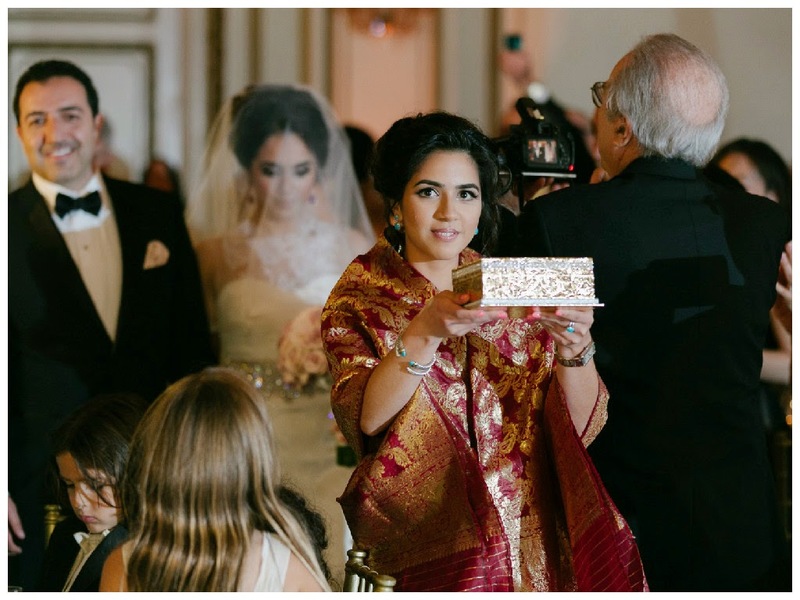 When I met Soraia the first few times I knew immediately we had a lot of things in common - our love to keep things classy, our love for family, and our love for Tory Burch! 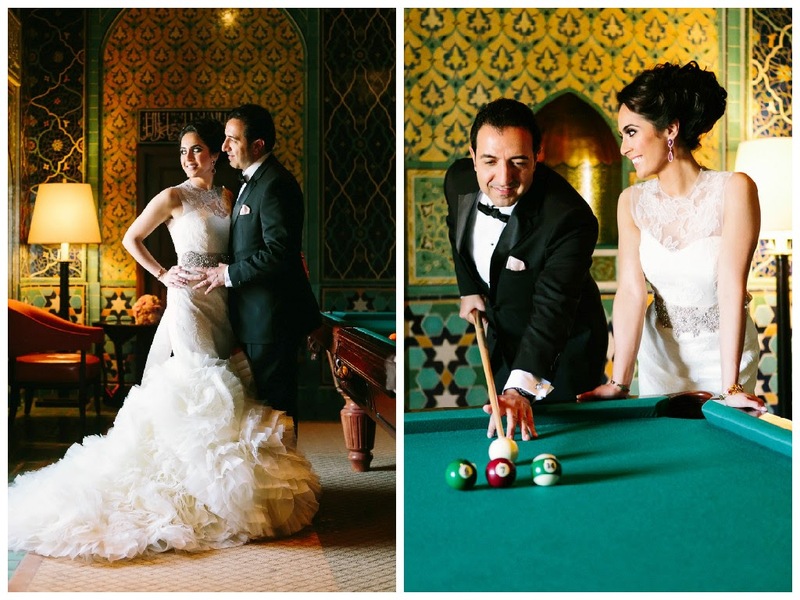 It was such a pleasure to work with this lovely couple. 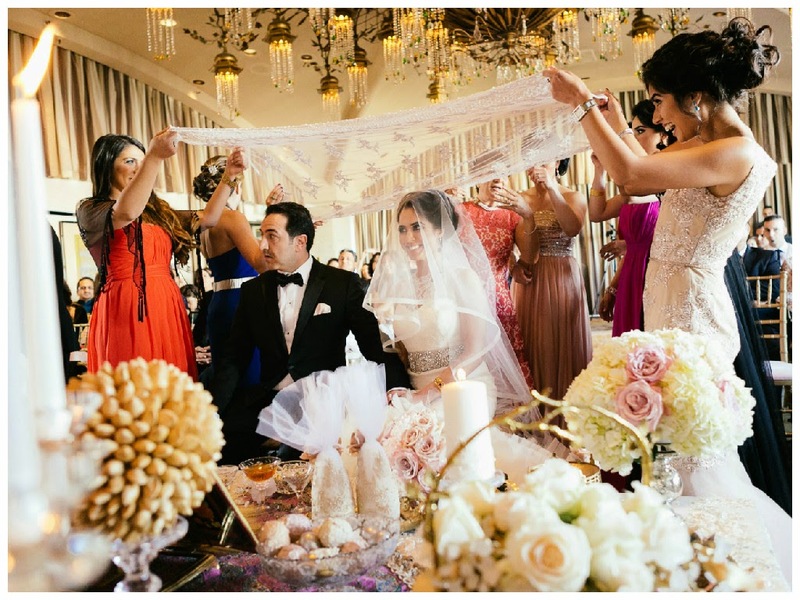 Soraia and Ali both cared about their families very much so it was important to honor both of their cultures - Persian and Afghan. 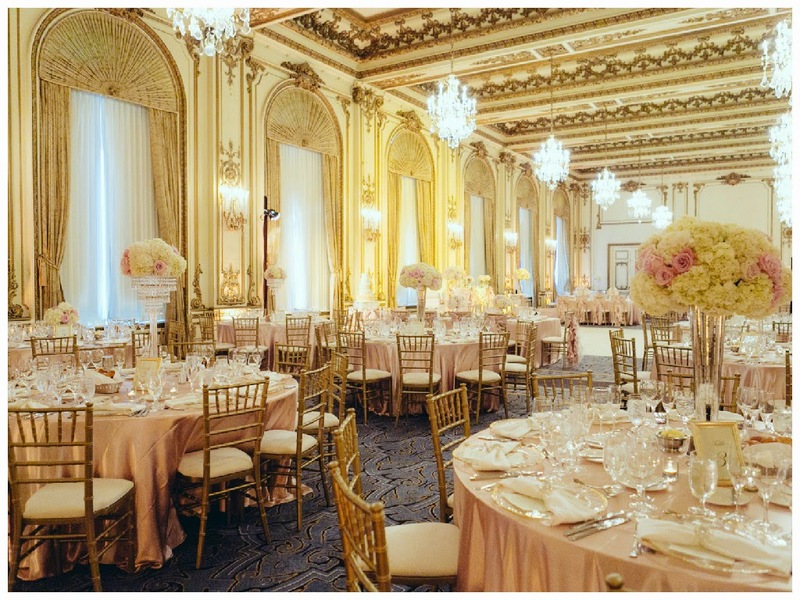 The wedding took place at the beautiful Fairmont Hotel in San Francisco. 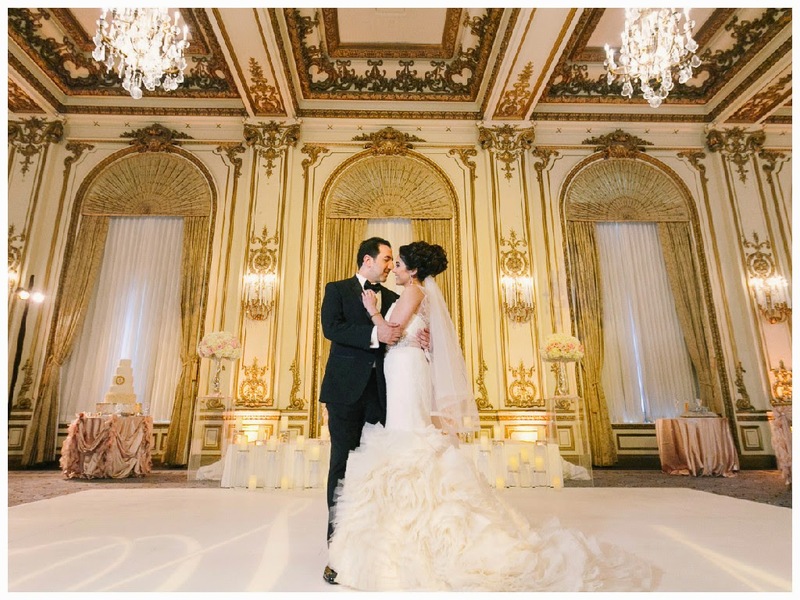 The venue had a classic elegance to it that we knew we wanted to continue throughout the wedding decor. 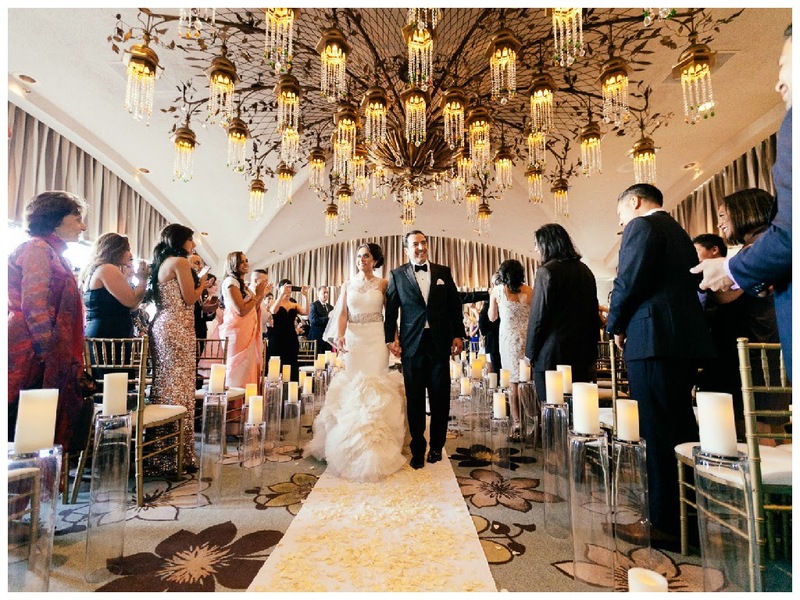 The Sofreh ceremony took place under a gorgeous chandelier. 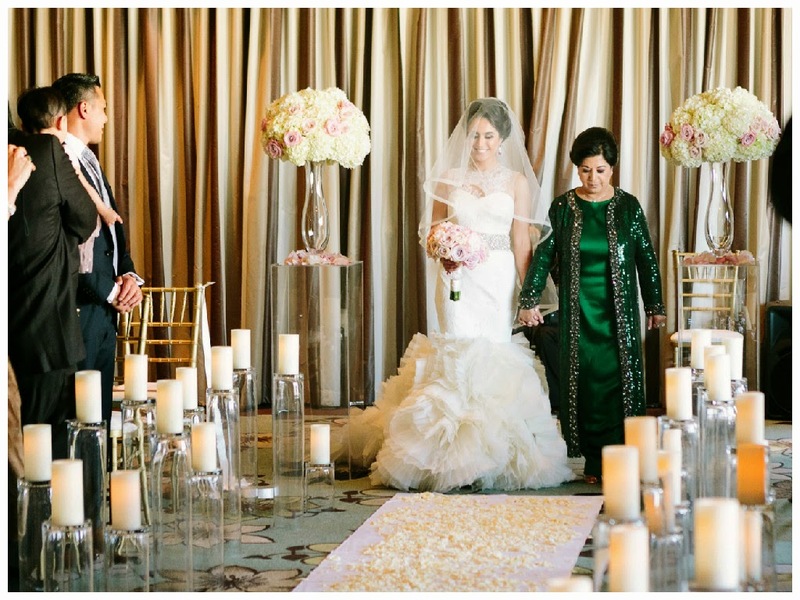 We lined the aisle with high and low pillar candles making a beautiful walk way for the bride and groom. 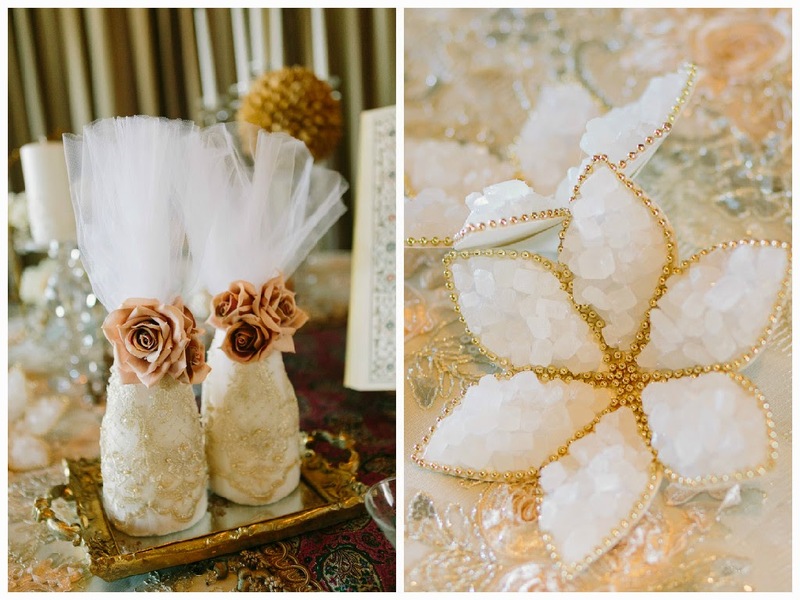 All the beautiful and intricate Sofreh items were provided by Pretty Please Design and our team helped style the spread. 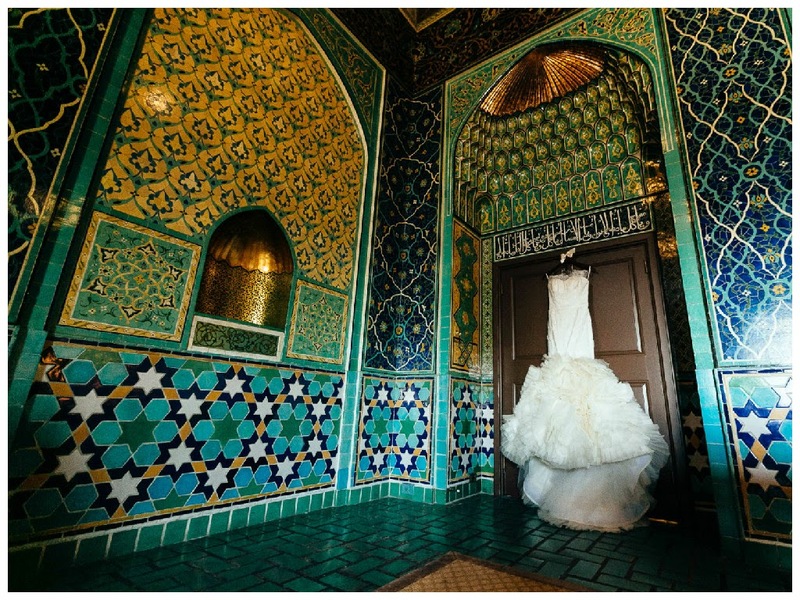 Since the ballroom for the reception was so elegant and ornate we went with a more simplistic approach to the decor. 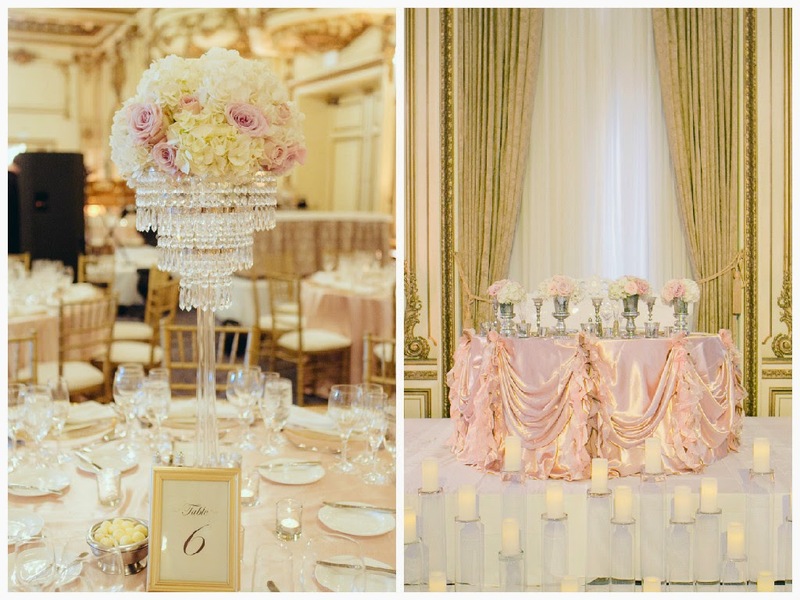 The tables were covered in a soft blush linen and we had hydrangeas and blush colored roses for the centerpieces. 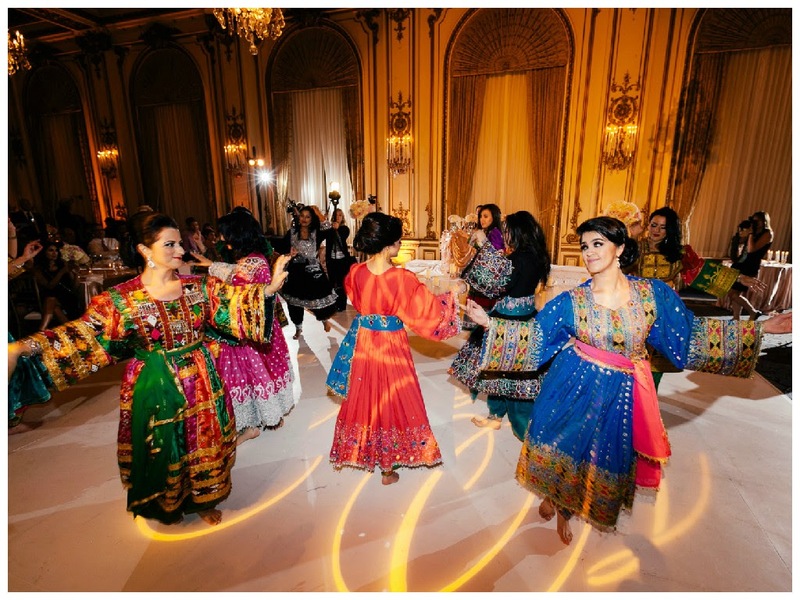 The sweetheart table was on a large stage to accommodate for the afghan traditions that would take place behind the bride and groom. 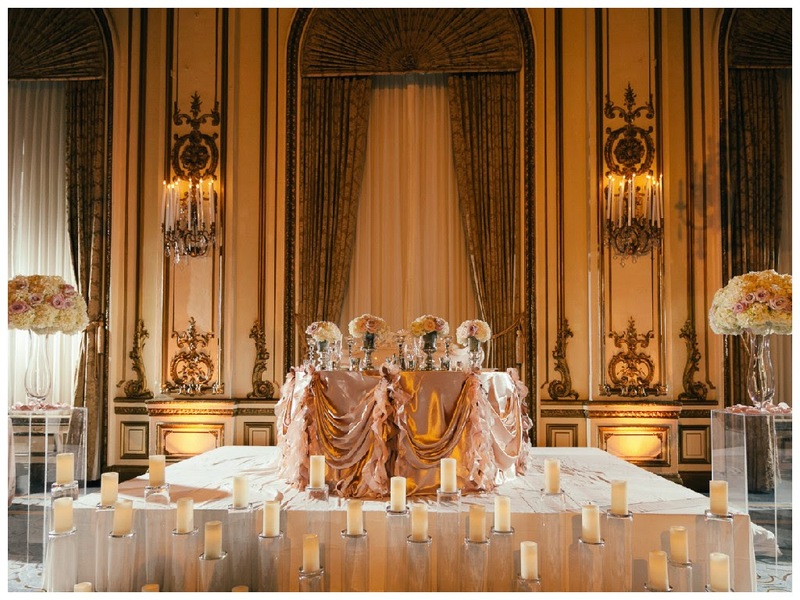 We re-purposed the high and low candles from the ceremony and placed them in front of the sweetheart table which created a beautiful illumination. 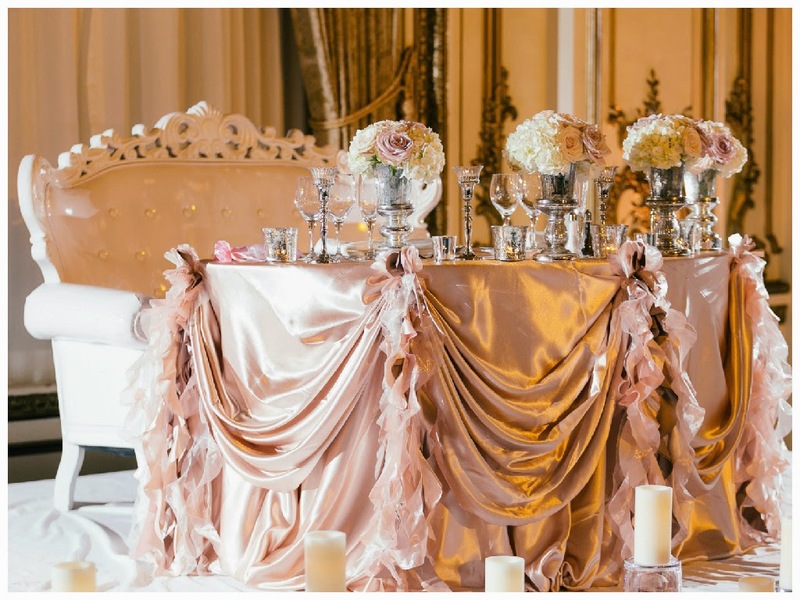 We also dressed up the table linen by draping it with curly willow ties adding a romantic element. 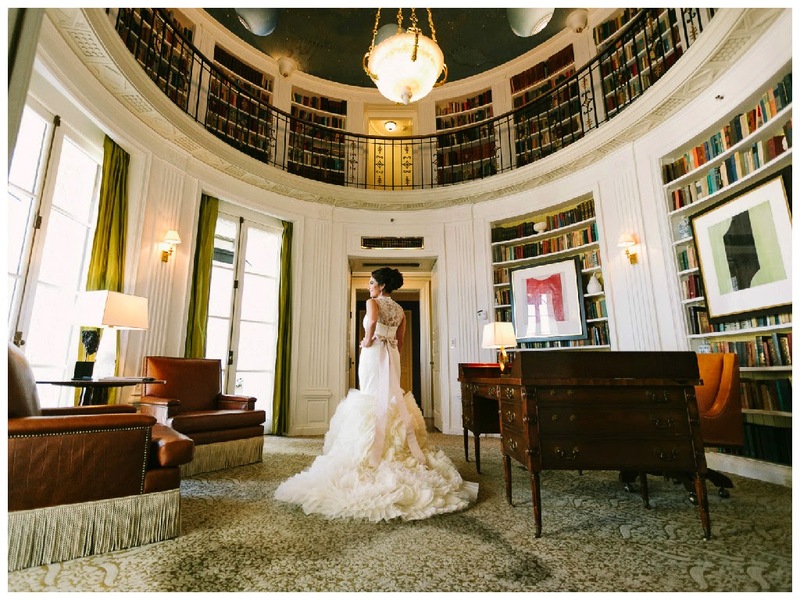 The bride and groom sat on a white leather tufted love seat. 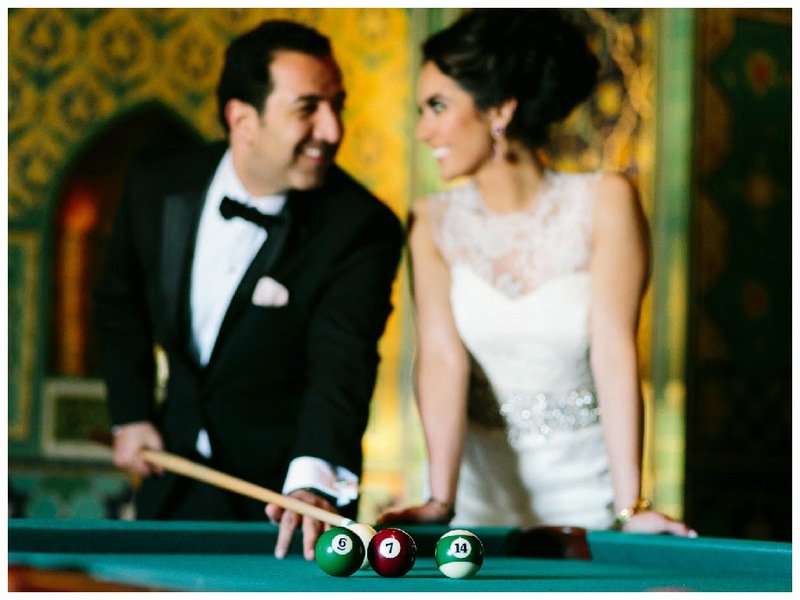 Soraia and Ali, we wish you a lifetime of happiness together and we hope to be a part of more of your celebrations in the future! 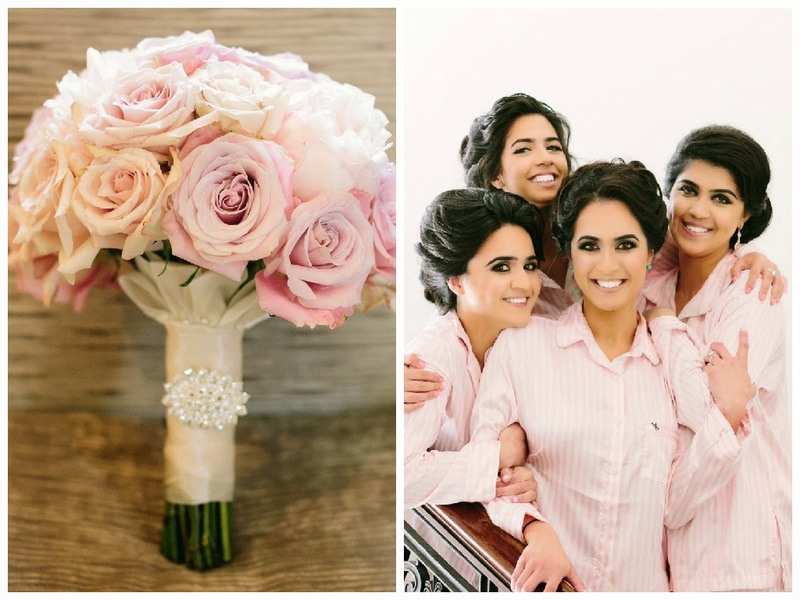 Tania loves things that are more natural and rustic, so immediately a theme came to mind - “Baby is Blooming”. 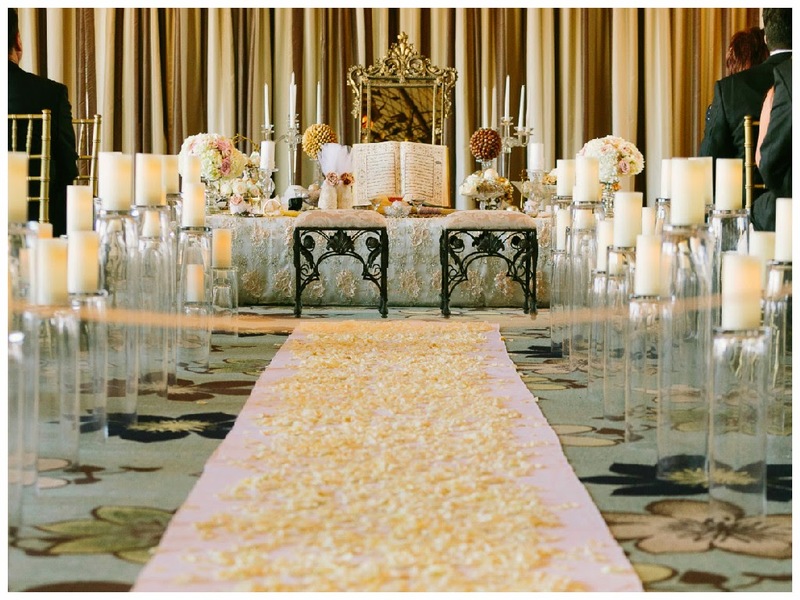 I wanted the overall design to have a lot of floral and nature elements almost as if you were in a garden. 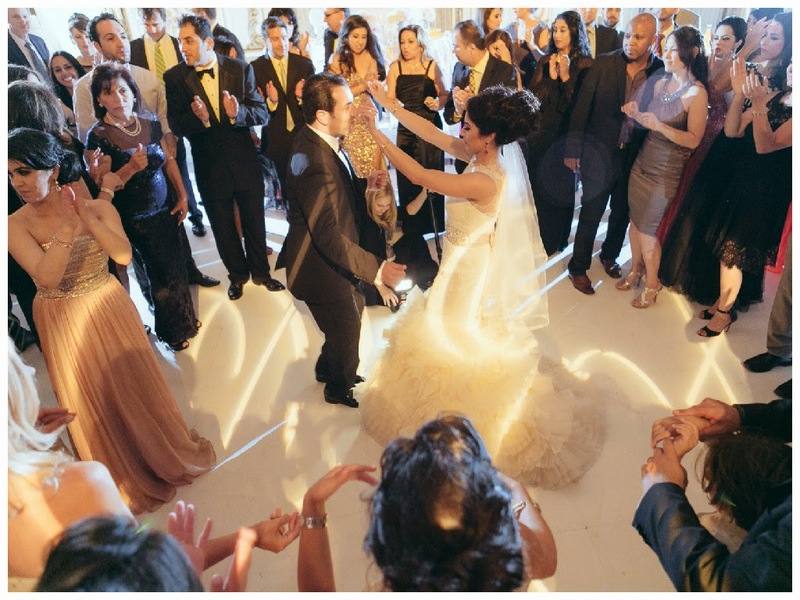 Tania's family are very dear friends of ours so we were so honored to be a part of this celebration. 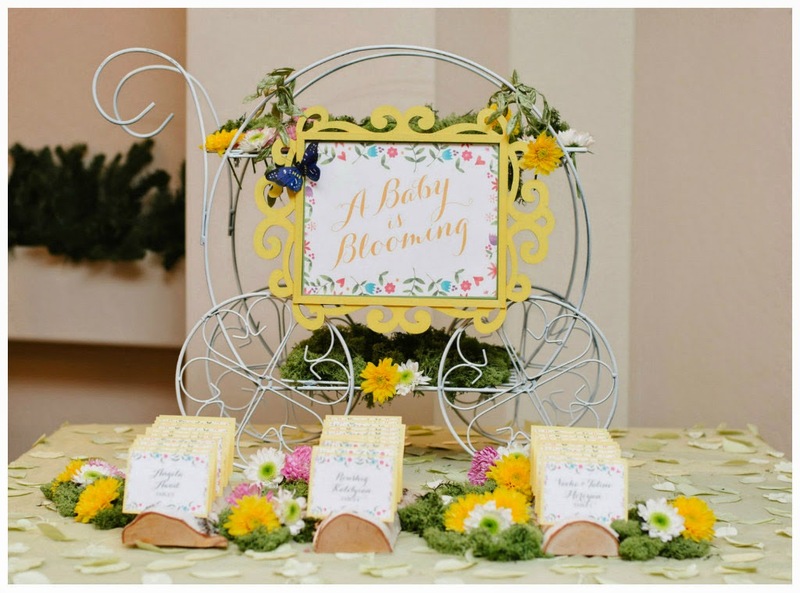 As guests arrived they were greeted by the welcome table which had a flower cart on top that was in a shape of a baby stroller. I attached a sign that said “A Baby is Blooming” to set the theme for the rest of the décor. 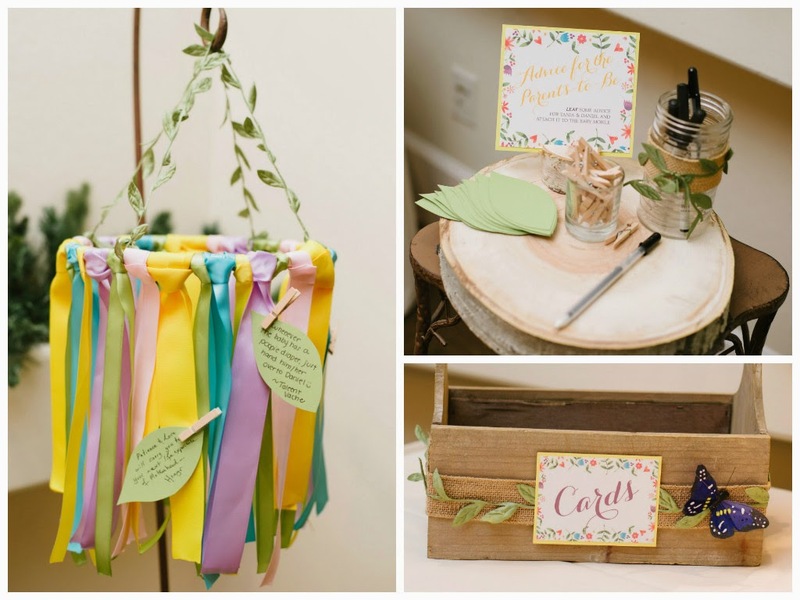 The place cards were placed on natural birch wood branches surrounded by flowers. 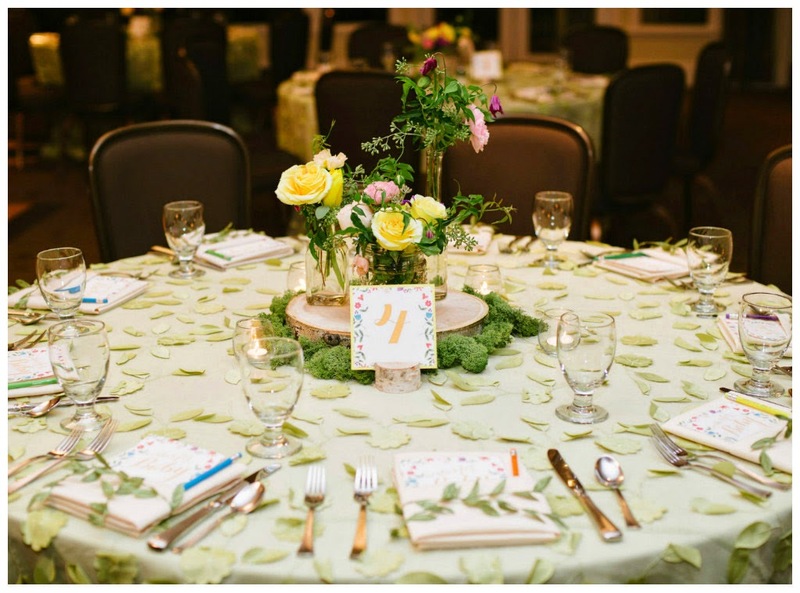 The dining tables were covered in a beautiful green floral linen. 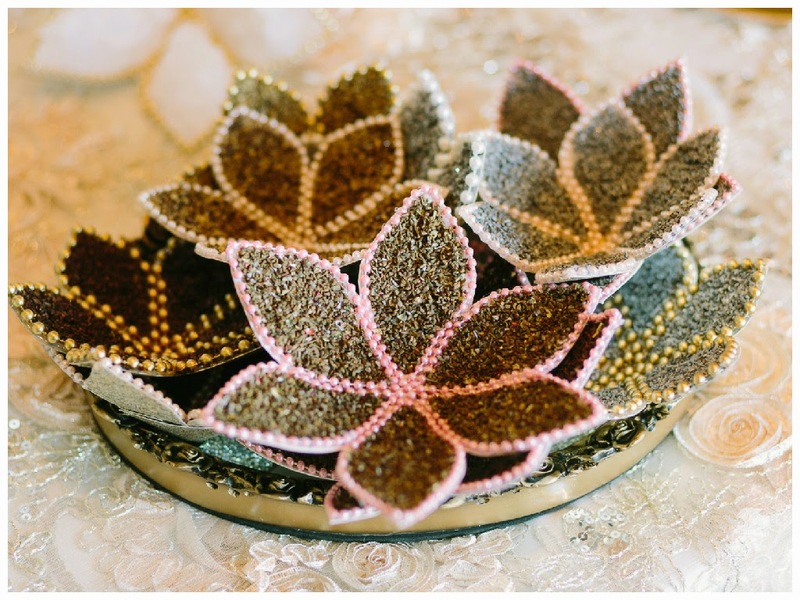 There were 2 types of centerpieces. 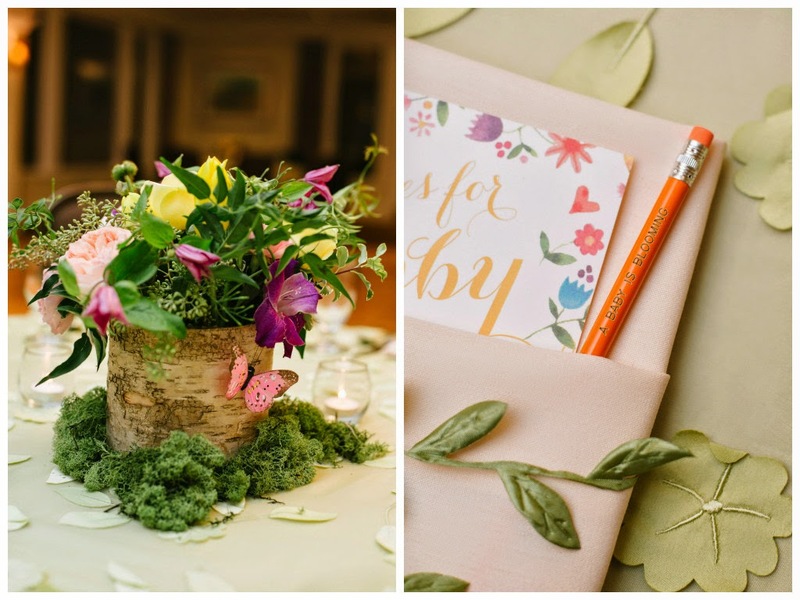 The first was a birch wood cylinder vase filled with a ton of greenery and garden roses. Moss was also added to the bottom for a more natural effect. 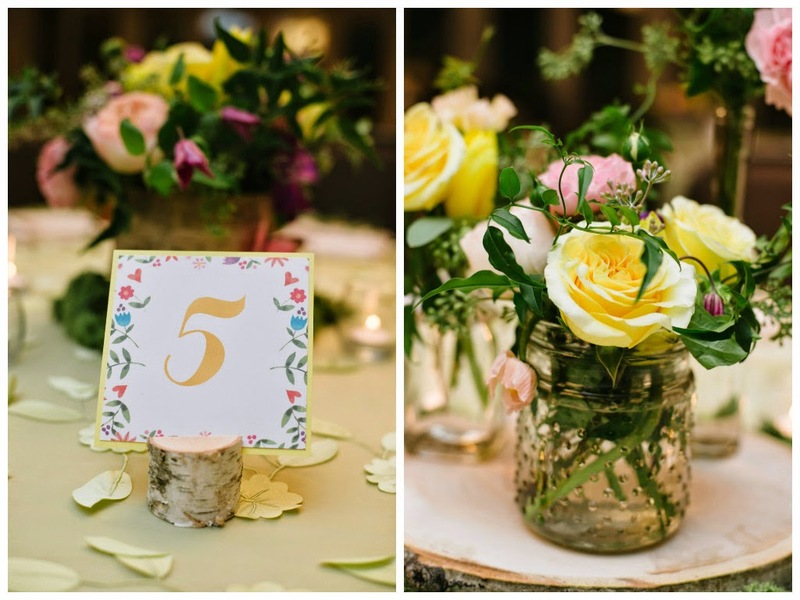 The second centerpieces was a slab of birch wood with 3 rustic glass containers that were again filled with a mix of beautiful garden roses. 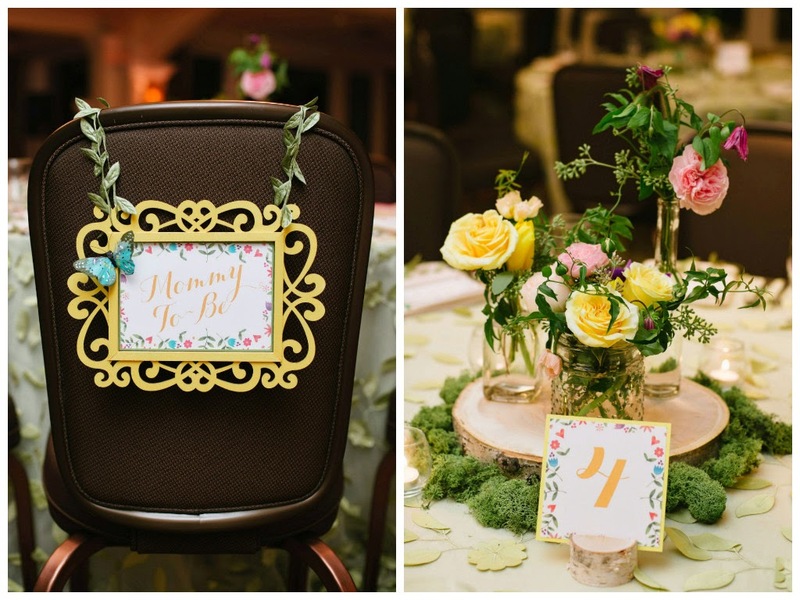 The table numbers were held up by a small piece of birch wood that had a slit. 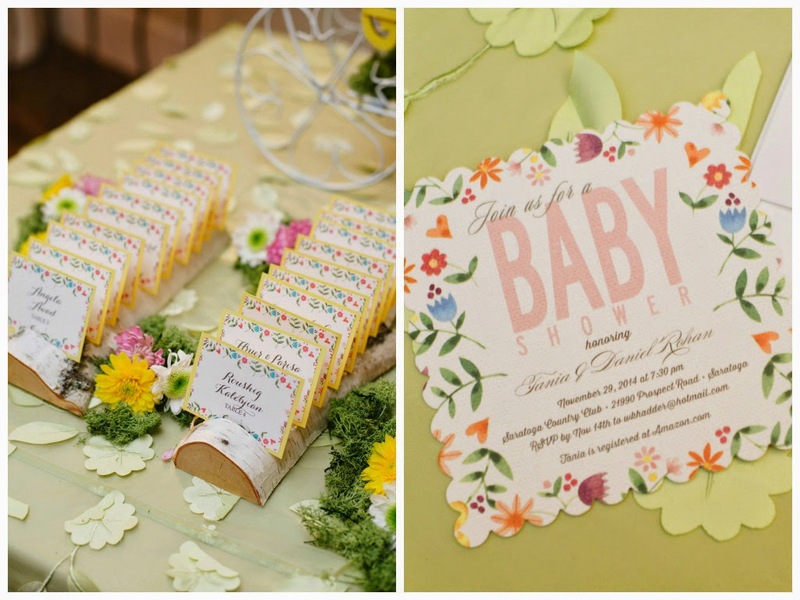 Each place setting was wrapped in a vine type ribbon and had a “wishes for baby” card for guests to fill out. 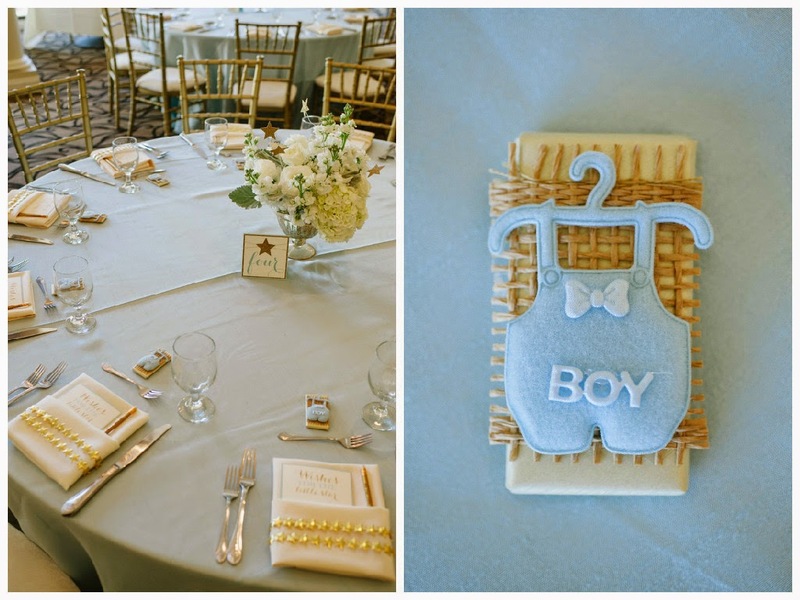 Each pencil had the theme of the baby shower “A Baby is Blooming” engraved for a special touch. 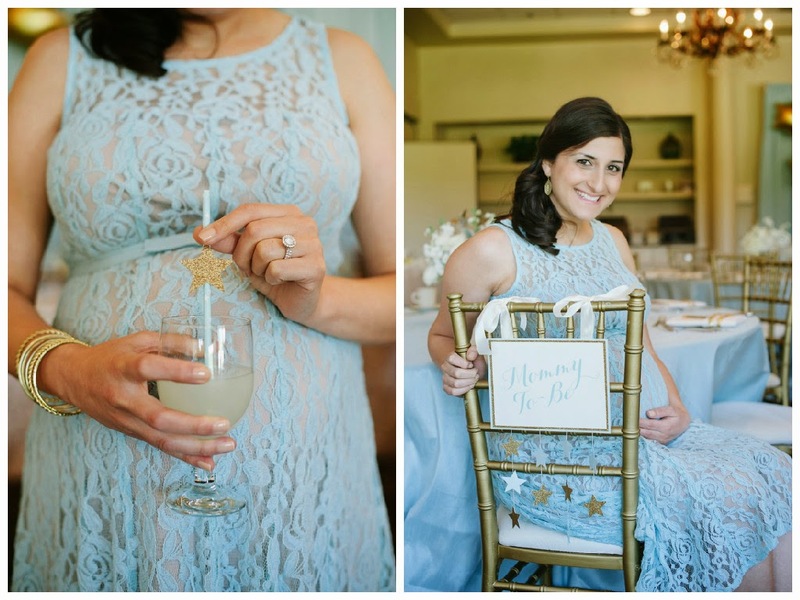 The mommy-to-be needs a special chair of course! 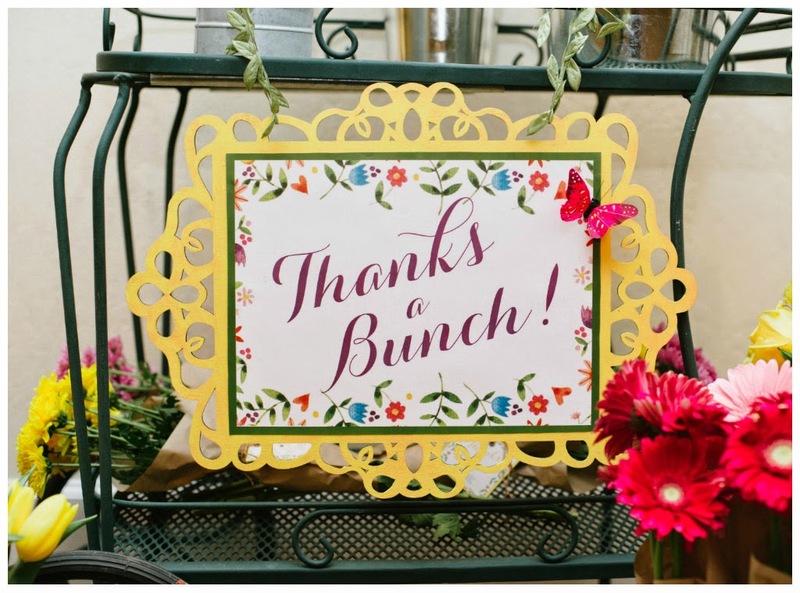 So I created a sign using an ornate wooden frame. The sign said mommy-to-be and it was hung by a vine ribbon. I added a butterfly for a nice touch. 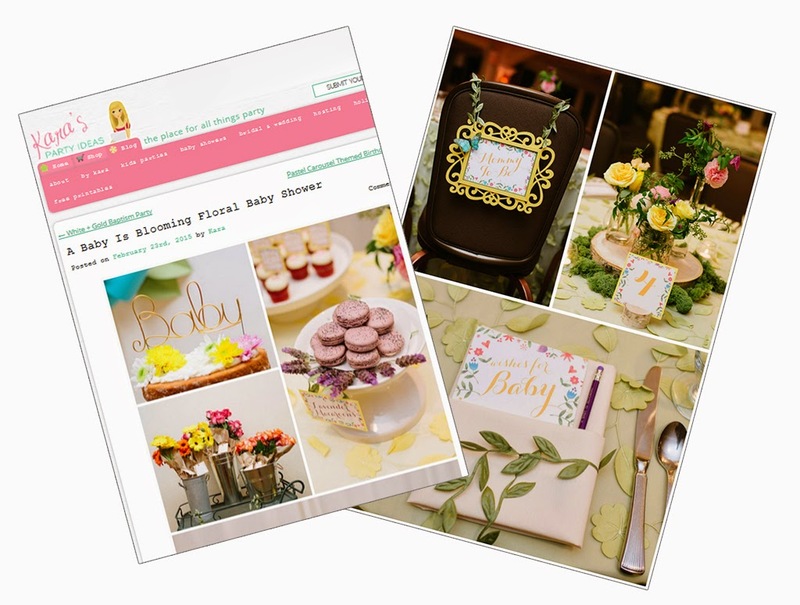 For a guestbook alternative I thought it would be fun for Tania to be able to take home a baby mobile that the guests contributed to. I made a baby mobile made out of different types of ribbon. 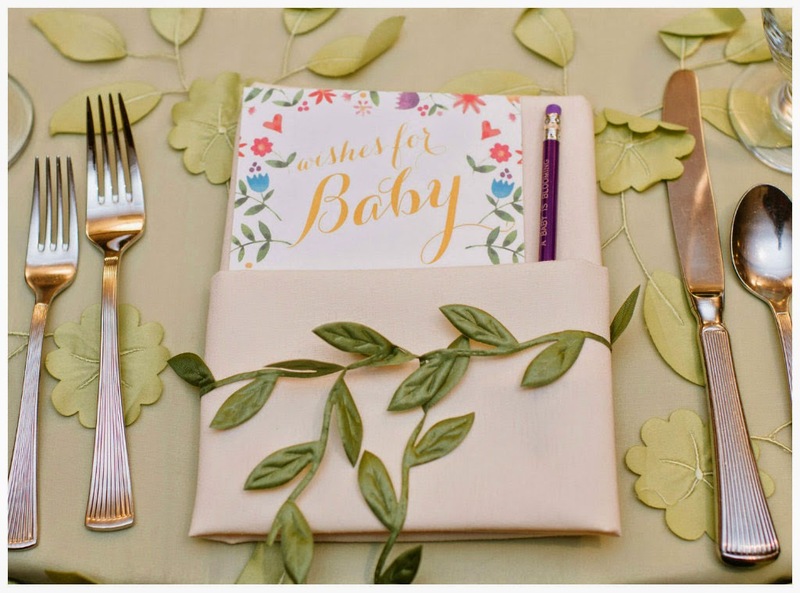 The guests were instructed to write their advice for the parents-to-be on a paper leaf and attach it to the mobile using a clothes pin. 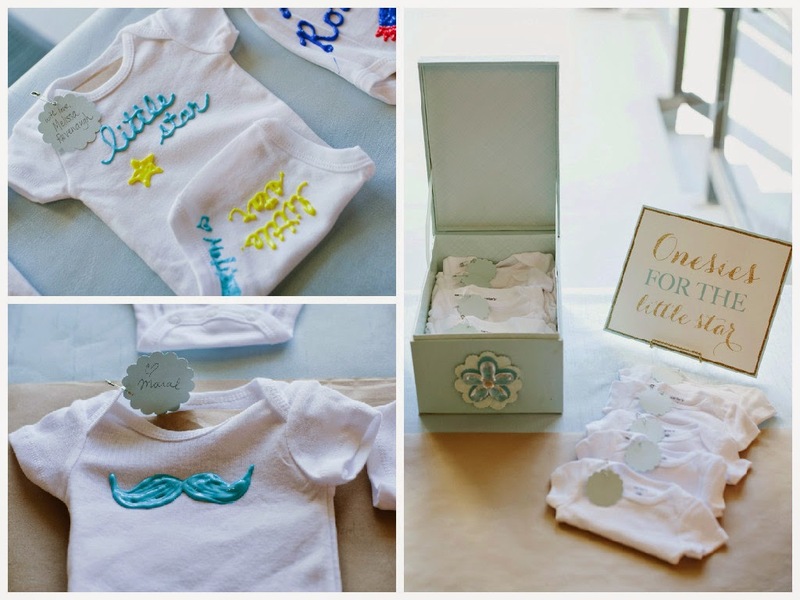 This is such a cute idea and a perfect way for the mommy-to-be to have a memento from her shower. 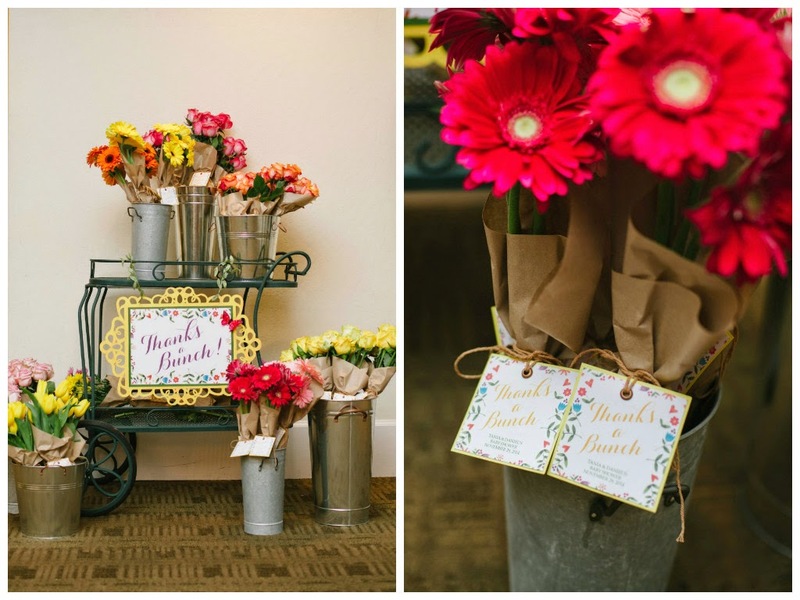 For the favors, I created a display that you would see similarly at a flower shop. 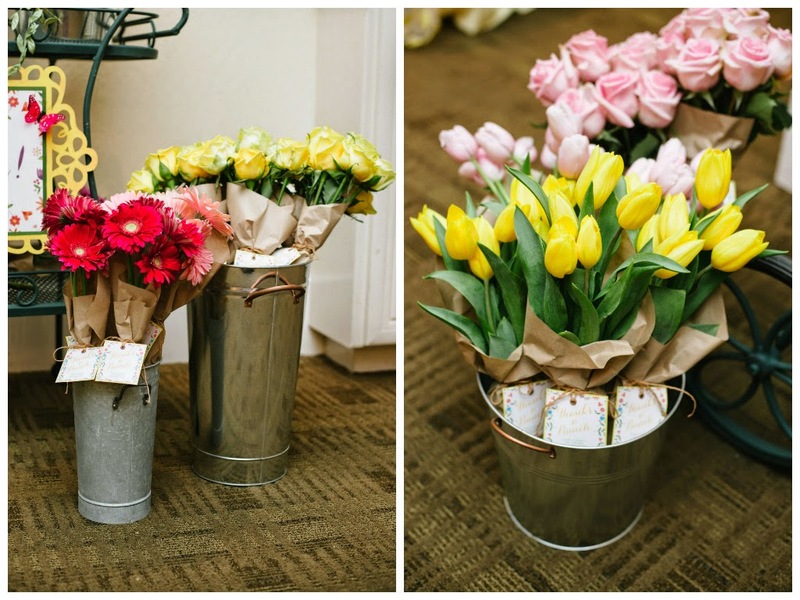 I used a variety of flower market buckets and a flower cart to display bunches of flowers. Each bunch was wrapped in brown paper and had a tag attached that said “Thanks a Bunch”. The dessert table was a hit! 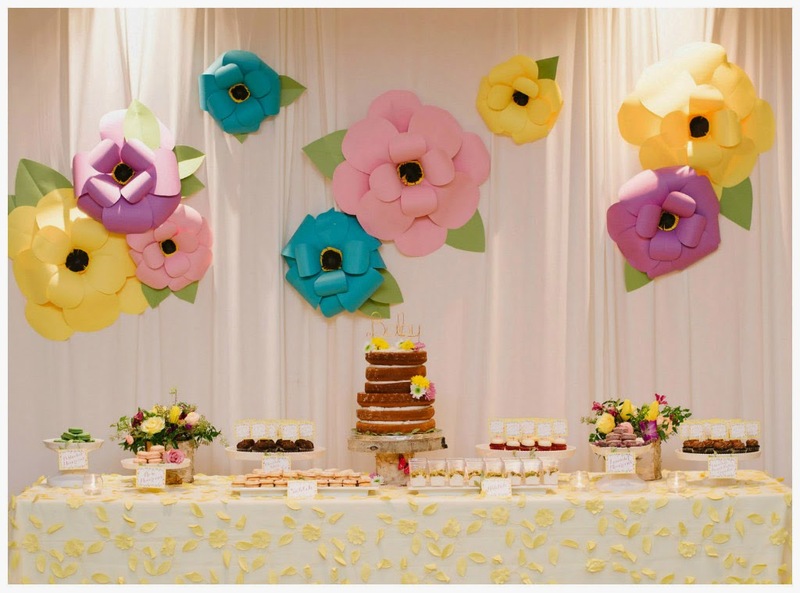 The backdrop was filled with a variety of paper flowers. 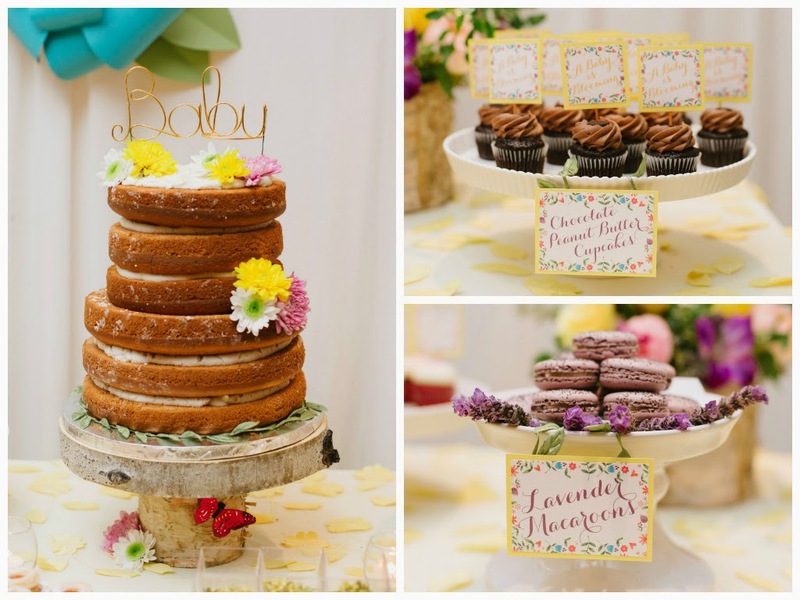 The natural cake was placed on a birch wood stand and embellished with fresh flowers and topped with a wire “Baby” sign. 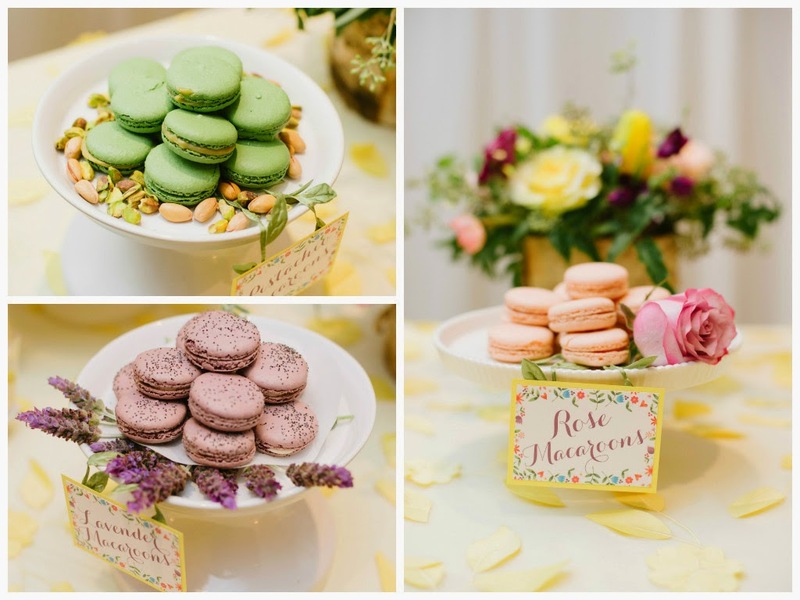 I displayed the macaroons in a way so that you can tell what the flavor was by just looking at the platter. For example, for the lavender macaroons I added fresh lavender to the platter. It was a huge hit!